It brings so much pride to us each time we get a mention. Whether it be a show report, or review it is always the same feeling. Thank you to the following writers for your kind words. "The JMW Alyson AML II is the best loudspeaker costing less than $10,000 per pair I’ve heard in my listening room." This was a highly significant pronouncement, something I’d not heard before over 37 years of marital bliss. My wife is a painter with, shall we say, a strong sense of what’s attractive and what isn’t. Her eyes narrow and her jaw sets when crates bearing loudspeakers for review arrive and, generally, her mood does not improve when the latest specimens are unboxed. So, the positive reception here of the JWM Acoustics Alyson AML II was a singular development. Of course, aesthetic appeal alone won’t cut it with this magazine and its readers. I’d experienced the Alysons at two RMAFs—an earlier version and this new iteration—and was impressed by what I heard as well as by what I saw. A full consideration was definitely warranted. Family is important to Joshua Miles. Accordingly, a number of JWM Acoustics products honor his family members: For instances, the Alyson is named for one of his sisters, and the Karen line of turntables for another sister, and the larger Jane JKM loudspeaker pays homage to his mother. Each pair of Alyson AML IIs is composed of two speakers and two matching stands. From the company’s operational headquarters in Austin, TX (where Miles returned in 2015), they are shipped in four wooden crates—Miles had some instances of damage when cardboard boxes were used—with an average FedEx Ground charge of $300. Environmentally conscious as he is, Miles encourages purchasers to return the crates to Austin for re-use and will share the cost of doing so. The stand, which is approximately 24" tall, is a simple but elegant- looking and structurally sound design. Two sturdy vertical elements that curve gently from front to back are attached above and below to thick slabs of the chosen hardwood. The base can be fitted with either spikes or rubber feet, both of which are supplied. The top hardwood surface, which exactly matches the shape of the loudspeaker’s bottom aspect, is fitted with four metal discs that accept small spikesfrom the speakers. The speaker is heavy enough that it will stay put on the stand in day-to-day use though if you inadvertently bump into the Alyson while walking past, there is the potential to displace the spikes from the discs—or worse. Owners of large energetic pets or who have curious children of a certain age (and/or clumsy tendencies) should be aware of this. The front baffle features meticulously beveled openings that function as waveguides for the three drivers. An important design feature of the latest Alyson is the presence of a sub-baffle to which the drivers are attached, fabricated from the same constrained-layer damping material that is utilized in the cabinet. (See sidebar.) On the hardwood rear panel is a 2 ½" port near the top and, near the bottom, a 3 ½" x 8 ¼" inset with two sets of nickel/rhodium fiveway binding posts. The Alyson AML IIs, the review samples sporting a gorgeous mango hardwood, ended up positioned close to where most speakers have performed best in my 15' x 15' space (a hallway off to one side prevents any issues with standing waves related to that symmetry; ceiling height varies from 10' to 12'). They were about 8' apart, center-to-center, with 2' between the back panel and the front wall of the listening room. It was 9' from the front baffle to the sweet spot. The Alysons were canted in by about 15 degrees; I could see the inner side of the enclosure from the listening position. With a few detours noted below, most of my listening was done with David Berning Quadrature Z monoblock amplifiers, a tube OTL design rated at 220 watts into 8 ohms and 270 into 4 ohms (the Alysons are a nominal 6-ohm load). Only digital sources were utilized. An Oppo 103, used as a transport, and a Baetis Reference 2 music computer sent data to a T+A DAC 8 DSD that directly drove the power amps. Digital cables included a Revelation Audio Labs Prophecy Cryosilver AES/ EBU (Baetis to T+A) or an Apogee WydeEYE WERR SPDIF (Oppo to T+A). Analog interconnects and speaker cables were Generation 5 Ultra. Listening to all kinds of music via the JWM Alyson AML IIs on a daily basis for more than a month confirmed my impression that this speaker is an exceptionally balanced design without significant deficiencies in any of the usual audiophile metrics. However, before touching on some of the parameters on what my colleague Anthony H. Cordesman has called “the sonic checklist,” I want to note the exceptional capabilities of this product when it comes to one vitally important musical content category: The Alysons are as faithful to the human voice as any speaker I’ve ever heard. Cones, horns, electrostatics, ribbons—I’ve not heard anything better. This is a loudspeaker you’d want to use for a contest among opera buffs to blindly identify legendary singers from the 1920s or 30s, or to parse the artistry of the great jazz chanteuses of the 1950s and 60s. This doesn’t always mean that voices sound “real” because with pop and rock music, singers often sound the way their producers (or even the artist themselves) want them to sound, for better or worse. But through the Alyson AML IIs, Johnny Cash, Bob Dylan, Joni Mitchell, Dr. John, and Emmylou Harris sound so recognizable, so right, that the tonal truthfulness of the speaker is obvious. With the best vocal recordings—say, Diana Krall singing “I Don’t Know Enough About You” from her Love Scenes album or the late Lorraine Hunt Lieberson performing “Ombra mai fù” from Handel’s Serse— the sense of being present at the recording session, of breathing the same air as the vocalist, is very powerful. This kind of fealty to tonal character extends to instrumental sonorities as well. The Alysons passed with flying colors the “Old Italian Violin Test” that I subject every loudspeaker I review to, reliably discriminating Stradivari from Guarneri del Gesù instruments on a recording featuring a single violinist playing the same concerto excerpt on 15 examples from each of the two famous violin makers’ workshops. On several recordings of Berlioz’s Symphonie fantastique, the cornet obbligato in the second movement “Un bal”—not always that easy to hear—was clearly played on the intended instrument rather than a trumpet. And on the Northstar Recordings SACD collection The Spirit of Turtle, on the ballad “Teardrops for Jimmy”, Maarten Ornstein plays a reed instrument that could be a sax, could be a B-flat clarinet playing in its middle register, but is actually a bass clarinet straining to play the plaintive melody in its highest reaches. This is apparent from the get-go with the Alysons (and confirmed halfway through the selection when Ornstein finally drops to some of the instrument’s lowest notes). In imaging and soundstage presentation, my initial impression was that these aspects of reproduction were done well, if not unusually so. At the beginning of the audition period, I had the Alyson’s tweeters aimed directly at my ears. When the speakers were splayed outward by a few degrees, I appreciated venue character and imaging to the degree I’m accustomed to hearing with other top loudspeakers. The Alysons did an excellent job of delineating the sonic perspective of a given recording—with chamber music, both the approach of putting the musicians in your room as well as engineering that brings one to the performance venue. Related is the way in which the speakers clarify detail. Listening to the RCO Live recording of the Shostakovich Symphony No. 15, a work (and recording) that’s extremely familiar to me, I heard instrumental doublings I’d not noticed previously. Well-engineered rock and jazz recordings also fared well when played back at enthusiastic levels. As especially enjoyable examples, I’d single out Steely Dan’s “Two Against Nature” from the album of the same name—a dizzying perpetual-motion machine of interlocking instrumental parts and backup vocals—and “Backrow Politics” off the Big Phat Band’s Act Your Age CD, which maintained coherency even when the four featured trumpet players let loose with simultaneous high-voltage improvisations. Three potential “interventions” should be mentioned for those who favor music that’s loud and low. First, the Alysons love bi-wiring. I tried this out with a pair of AntiCable bi-wires and found that detail with especially dynamic material improved. Secondly, solid-state amplification (I tried my Pass Labs XA 60.8 monoblocks and an older Parasound stereo amp, the HCA 2200II) might provide more controlled and tuneful bass than that heard with even very fine, powerful tube amplification. Third is the use of a subwoofer. This, of course, can be a tricky business with in-between-sized loudspeakers like the Alysons, and manufacturers of such products can be kept up at night worrying about how a reviewer or customer is going to screw up the sound of the their carefully voiced full-range transducer. But I couldn’t resist. I have an excellent sub, the Magico SSub that I use with my Magico S3 Mk IIs. Sending the digital data stream to an Anthem D2v processor for bass management and D to-A conversion, I ran the Alysons full range and the subwoofer up to 40Hz. The results were mixed. The Saint-Saëns gained in visceral impact when loud organ-pedal notes energized the room, and listening to some LCD Soundsystem tracks (“Emotional Haircut,” “Dance Yrself Clean”)… well, gut-wrenching bass is kind of the point. But with older rock recordings, the benefits, if any, were less clear-cut. Tom Petty passed away during my time with the Alysons, and I listened to many of his timeless songs. With the subwoofer on, “Running Down a Dream” lost some of its buoyant optimism; the life-affirming sense of driving fast down a highway with the top down after the rain has finally stopped. Clearly, a subwoofer must be employed judiciously with the Alyson AML II. The JMW Alyson AML II is the best loudspeaker costing less than $10,000 per pair I’ve heard in my listening room. That would have been my assessment, I think, even if I hadn’t seen the things—the beauty here is very much more than skin deep. Joshua Miles may be a chill guy with shoulder-length hair who once made his own surfboards and still ends emails with “Aloha,” but the current Alyson is a very traditional highend product in that an exceptional sonic result has been achieved thanks to the diligent, yet imaginative application of tried-and-true methodologies. The tweeter isn’t sprinkled with pixie dust and the woofers don’t incorporate a material previously known only to NASA. There are familiar aspects of the enclosure’s construction; the crossover has a very simple topology. But there’s a harmony achieved in the acoustic design of these speakers that’s a brilliant reflection of the artistic sensibility that informs their appearance. On a bright December afternoon, the Alysons left for their return trip to Austin. But they could have stayed, and in the living room. My wife said so. Dimensions: 8 ¾" x 22" x 16 3/8"; stand, 14" x 24" x 20 5/8"
Just to confirm: The four visible pieces of wood in the Alysons are solid pieces of mango, not veneers? I use solid hardwoods in my designs. And I use no CNC in any part of the construction. This includes the bevels on the waveguides and sub-baffle components. Yes, I’m nuts. I want to maintain “handmade” as long as I can. Veneers can be nice, and I have used them on cabinet bodies, primarily for custom installations. I always felt they were not permanent, though. Not real. Solid woods and hand tools are what I was brought up using, so for now I’ll stick with them. Do you fabricate most of the speakers you sell from the six “standard” woods listed on the website? How often is it something else? About 50% of my machines are ordered in monkey pod, 25% mango, 20% blood bubinga, and 5% the others. Only once in a while will I have a request for anything outside of the woods listed on the website. Now that I am in a new environment [Austin, TX] I have a much larger selection of locally grown materials such as pecan and spalted cyprus. I spend a great deal of time picking the woods I use, so I have never had an issue with the sonics. It is certainly true that some woods can make a difference, but in my application it is very consistent. Where does the wood come from? You talk about the material being obtained in an environmentally responsible fashion. What does that mean? Do you age or otherwise prepare the woods before incorporating them into a JWM Acoustics product? For the last fifteen years I have primarily been sourcing my woods from the Pacific islands. Exotics are largely sourced from Africa, South America, and Asia. Now that I am in Texas, I am discovering many more domestics than I had ever imagined. One big rule though: All the woods are from naturally downed trees only— no slabs are sourced from harvested forests. It is much more difficult to find the materials this way, but it’s important to me. When sourcing materials in this way, often slabs need to be dried for a very long time. The mango on your speakers came into my shop five years ago. It came from a beautiful tree that fell in high winds near South Kona. After being air- and kiln-dried for four years, I received the slabs to finish drying for another four. Not all woods take as long, but the average is two to three years before the moisture point is low enough to begin working with them. To further offset the use of trees in my work, I volunteer in reforestation efforts. Each year at Hakalau National Forest Reserve, working with a group I plant nearly 10,000 koa tree seedlings. Perhaps in 150 years, one of these trees will be used to make a set of speakers. I understand that the use of a sub-baffle to which the drivers are actually attached is an important difference between the new speaker and the original Alyson. What’s that made of? Were you indeed hearing important differences between JWM speakers that were allegedly the same model but incorporated different woods—differences that have been minimized by the new design? Yes, in the previous design, the drivers were bolted directly to the front baffle. Although the sonic effects of using different woods were minimal, there was indeed a difference, mainly caused by the density of the particular material. For instance, monkey pod is roughly 25% less dense than say, a red oak. The harder the wood, the higher the probability for ringing. Too little density could make the speaker sound slow; too dense and it starts to sound bright. With the use of accelerometers, the raw wood can be measured for its ability to hit the sonic sweet spot. In the AML II, the addition of a sub-baffle has almost eliminated those subtle differences and made the speaker a more consistent product. I have chosen the materials for the sub-baffle to be close to that sweet spot. It’s constructed from three layers of resin-based fiber material, each with a different density than the other. I mixed, matched, and played with the materials and design until I hit that sound I love. What material is used for the painted surfaces of the speaker? It’s not the same wood that’s used for the front and rear panels, is it? The body of the cabinets is constructed out of laminated and alternating layers of wood and epoxy-based fiber materials. They are sprung in the same fashion one would see in a drum shell. This provides just the right amount of rigidity and strength needed for the design. The angle and curves vary from model to model depending on what I need the air inside the chambers to do. The woods I use are alternating layers of maple, birch, and paulownia. If you are not familiar with paulownia, it is used by luthiers for the body of some stringed instruments, such as the koto. The tone of the wood is spectacular, and it just so happens it is very sustainable as a fast-growing tree. In concert with the different densities of these woods, the epoxy/fiber layers provide me with a great platform for a tuned cabinet such as the AML II. When the newly activated Austin Audio Society held a couple of meetings in 2017, I was lucky enough to spend extended time with some new gear in rooms more typical of domestic listening environments than one experiences at an audio show. As luck would have it, at two consecutive meets of the group I got to hear the same pair of JWM Acoustics speakers driven by a couple of different amps. I was impressed enough with the sound of these speakers, the Alyson AML II, and the good conversation I had with company chief Josh to request a pair for review. JWM Acoustics is a small company that specializes in handmade audio products, particularly but not exclusively loudspeakers. Based in Austin after relocating in 2016 from Hawaii (not an easy place for a speaker manufacturer who has to ship large boxes), Josh and the team are a little different than many loudspeaker companies. Rather than offering a fixed product, they work more as a custom shop, focusing on handmade designs of select components and tailormade solutions for specific customer needs. While this sounds like a difficult way to connect with a broader audiophile community, it does mean that JWM are pushing through designs that are meaningful to Josh and which have a unique, bespoke quality lacking in mass-produced designs. While the focus of this review is the Alyson AML II stand-mounted monitor, JWM Acoustics also produce turntables. On first appearance they might seem like modified Regas but in reality they are a mix of more advanced and heavily tweaked components coupled with beautiful and functional plinths designed and built in house. Having heard several versions of these comparatively affordable tables (ranging from $1500 to $6000) I understand why some people think highly of these designs. I can’t imagine their top table ever being the weak link in an analog system. With a background in pro-audio, Josh has an ear for accurate sound, which he brings to the design of his speakers. The Alyson AML II employs a modified D’Appolito (midwoofer-tweeter-midwoofer) driver system loaded in a custom hybrid band-pass/transmission line cabinet, finished in a range of wood fascias. Now don’t be fooled by that ‘fascia’ word. The wood here is solid, deeply grained and truly furniture-grade. While there are many similar designs, JWM goes further than most, not just by providing beautiful cabinetry, but by customizing the drivers in-house. Sourcing the parts from Scanspeak, providers of drivers to more name-brand loudspeakers than you could easily count, Josh hand-assembles these to achieve the sonic results he wants and tweaks the crossovers to get the best match for each pair. There’s no production line formula operating here. Lead time is 6-8 weeks and the future owner has ample opportunity to shape the look to their taste. When JWM Acoustics tell you their designs are customized, they mean it literally. This is old school manufacturing at heart, but the results are contemporary and very sophisticated. While looks are always a matter of taste, I think the JWM Acoustics gear that I’ve seen has an organic, modern look that is unique among audio products. I’ve never had the benefit of a manufacturer personally deliver a product for my listening but Josh did drive these to my house and do the basic set-up in my room. If you think this conveyed some special treatment, think again. Josh is a relaxed man and just asked me where I would put these, then he positioned the stands, made sure the spikes on the bottom of the speaker sat cleanly, let me fire up some tunes to make sure all was good, and left. He made no comments or attempts to position or otherwise influence the set-up, but headed off and told me to let him know if I had questions. For the next two months I ran these daily, playing everything I normally play for my listening pleasure, with only occasional reconnection of my reference Von Schweikerts to give me specific comparisons when I felt the need. But to be honest, I rarely felt that need. Once I’d made some final adjustments to the layout, the speakers were a little over 8 feet apart and nearly 6 feet from the front-wall, with very slight toe-in. This placement was not difficult to determine – the Alysons don’t seem to be too fussy but a little room to breathe all around made for a well-balanced and even soundstage. The Alysons are biwire-ready which is how I ran them (they come with excellent metal jumpers otherwise). They also have carpet piercing spikes which I did not use, opting instead for the rubber feet option on the stands to ease placement and save my own floors for the review period. Stand to speaker interface was spiked, the custom stands having precisely placed receptacles for the sharp points. Sometimes you put a component or speaker in and you just note the change immediately. With the Alysons it was more a case of recognizing their true qualities after I removed them, so seamlessly did they work in my system from the start. I typically find speaker changes induce the greatest initial adjustment in my room but that did not seem to be the case here. First impressions confirmed what I’d heard in the local shows: these were extremely musical and clean sounding. Yes, they are perhaps slightly bass-light compared to my floorstanders but from the start I found them to perform at a level that did not draw attention to a change in sonic presentation as might be expected when changing a floorstander to a standmount. Within a day or two, I was so used to the musical presentation emanating from my rig that I ceased thinking in comparative terms and found myself just playing music. To be honest, it was the visual sight of the white and wood cabinets that captured more of my attention than anything else. Every time I looked at the rig, this was the change that jumped out at me as the striking physical looks of the Alysons just seemed to complement my decor and invite me to stare. In determining how a speaker works in my room, I throw all genres of familiar music at it and try to sense how well they compare to my reference pair. I also tend to buy new music regularly so it’s possible during any review to hear some recordings for the first time on the review product before hearing them on my reference. I find this combination of listening experiences to be most useful when trying to evaluate what I am hearing. First listens with the JWMs involved some older jazz references such as Coleman Hawkins, Archie Shepp and Kenny Burrell on CD and LP. From there I moved on to more contemporary recordings that I know intimately, such as Ronnie Earl, Pat Metheny and Tord Gustavsen. After that, it was “come what may” as I played what took my fancy on any given day, which ranged from choral to metal, ancient to modern. Viktor Uzur’s solo cello work is as important to me as Count Basie’s big band swing. I never got the idea that some speakers are best for certain kinds of music. I need mine to do it all. Characterizing a speaker’s ‘sound’ is far from simple but let me try to convey what I heard with these in my room for several months. Typically, people invoke a spectrum from warm to bright, or concentrate on bass or upper frequency details to convey sonics. I understand the tendency but it’s not really how I hear music. For me, the whole is more than the sum of the parts, and more important too. I only find myself thinking about details such as extension or resolution when I make myself listen for such qualities. For the most part, I want to hear instruments and humans that sound real to my ears. The Alysons deliver on this primary attribute in spades. Strings, brass, percussion and vocals have a palpability that is realistic and engaging. If it’s on the recording, the Alysons let it through, be it female jazz vocals, hard bowed cello strings or finger picked guitars. The timbre of real instruments comes through pleasingly and from there, it became easier for me to start really listening in a way that allows for dissection of the constituent elements audiophiles seem to cherish. So let’s take the Alysons apart sonically. As monitors, you might worry about limitations but these speakers provide room filling sounds that never, ever, feel strained, even at loud volumes. Of course, I was using high-power amps but the ease of music coming from the Alysons was pleasing at all volumes. Pick your usual terms (soundstaging, lack of distortion, ease etc.) and these not-so-small speakers always felt as if they were operating comfortably, without strain, to deliver an ear-pleasing and full scale sound in my 25x18ft room. Further, their sonic signature is detailed but never harsh, with a resolution and air that matched my reference Vons on the mids and uppers. When the term ‘resolution’ is applied in audio it can mean different things to different people. For me it refers to a reproduction that is revealing of small nuances in the music that can be blurred or missing in some set-ups. It does not mean bright or accentuated treble but might be thought of more as the sound of Pat Metheny’s fingers shifting on the neck of his acoustic guitar, the slight intake of breath from Archie Shepp in a saxophone solo, the soft brush of Paul Motian’s cymbal that accentuates but never displaces a foregrounded piano note. These are the kind of details that make recordings come to life, but they need to be presented naturally, as part of the musical content without the speaker sounding as if such details are emphasized over timbre, instrumental decay or accompanying musical lines. When delivered correctly, as they are with these speakers, recorded music can draw you in to the experience of the performance, resulting more in pleasure with the sound than admiration for accuracy. If the Alysons are pleasing on jazz, let me tell you they also sound tremendous on rock. Even though the Alysons might not plumb the lowest depths, there’s a punchiness to the sound that gives great drive to music and transports you with the beat. It was during this period that I listened to Deep Purple’s latest Infinity album, and while I was slow to appreciate its qualities at first, as I moved the JWM’s into the rig the album grew on me, with great swathes of Hammond organ and Steve Morse’s frenetic lead guitar swirling around in classic Purple fashion. In a similar vein, Gretchen Menn’s Abandon All Hope has become a regular listen over the last few months. Her fretboard dynamics on this album of heavy instrumentals invited cranking, and the speakers responded in style. Fear not rockers, the Alysons will deliver the goods. During this time I also got to hear the latest Roger Waters release, Is this the life we want, and while the absence of guitar on a Waters album still disappoints me, I found myself being sucked into the music to the point that had me pulling out earlier Waters solo albums for comparison. Yes, Waters has chosen to explore a more contemporary production to match the current affairs themes of the songs but listening in the fuller context of his body of solo albums via the Alysons, I found myself appreciating (again) how important an artist he is. Vocals through the JWMs were uniformly excellent. Sure, Holly Cole always sounds present but so did Tom Waits, Van Morrison and Leonard Cohen. Yes, that goes for Anna Netrebko also, whose Sempre Libera SACD on Deutche Grammaphon came off the shelf after a long break to remind me of her quality. In each case, I found myself listening closely to vocal articulation and felt I could hear the lyrics cleanly and with a sense of a real singer appearing between the speakers. In fact, I started to enjoy Cohen’s You Want it Darker more with the Alyson’s than I had when I first listened, although I can’t explain why this is so other than I heard the man singing and it captured me. Had his death softened me up? I don’t think so, the album sort of did not register fully with me before, but listening to it seriously with the Alysons got me hooked. I mentioned the fit and finish of these speakers already but it’s worth reiterating, these attributes are more than just good looks. The Alysons possess a real solidity with a curved shape that serves to launch the sound into the room in a smooth, unruffled manner. The matching stands give the whole speaker a sort of modern, sculpted look that gives the appearance of an art piece rather than a speaker cabinet. On looks alone, you can tell these are not cookie-cutter designs like so many other ‘drivers-in-a-box’ that fill the marketplace. But the looks are ultimately not why audiophiles make purchases, it’s the sound that counts (or so we all claim). On sonic measures alone, I consider the Alysons to be exceptionally good. The looks just complete the package. Amp-wise, I found the PS Audio BHK monos to be a superb match, the resulting sound being huge, detailed but easy on the ears. The BAT VK500 easily drove them too, but with a warmer, softer manner that lost something of the BHK’s soundstage size. I’ve now heard these speakers in various settings with more than half a dozen amps, from low wattage integrateds to large solid state monoblocks, and I don’t consider these speakers to be a difficult load. When I think of all the speakers I’ve heard over the years, the correlation between sound quality and price seems less than perfectly positive. Most expensive turntables I’ve heard are better sounding than cheaper options (with all the usual caveats) but I am not so convinced by speakers above a certain price point. To my ears, the best speakers have a coherence, timbral realism, and ease that allows music to flow with the ease one hears from live instruments. No amount of volume handling ability, bass extension or detail can make up for a shortfall in those key elements – at least for my enjoyment – yet it is often more bass or greater volume handling that you are offered when you spend more. Give me timbre anyday. So where, you might ask, do the JWM Alyson speakers fit in the grand scheme of things? While not floorstanders, the Alysons sound as if they are, and not in some overachieving, bigger-than-they look kind of manner – they really do sound full-range. They might technically be standmounts, but they are not small speakers by any measure and it’s hard to compare them as such. My favorite small speakers are the Harbeth P3ESRs I reviewed a couple of years and raved about for their musical qualities. The Alysons sound way bigger than the Harbeths (and they physically are!) but have some of the same magical realism that makes them a joy to hear. It’s more fitting, I believe, to compare the Alysons to excellent standmounts from Prana Fidelity or Bryston that I have reviewed over the last few years. I really liked both the Fifty/90s and the Mini T’s as they made music that sounded right to me, but I think the Alysons might have the beating of both in my room. Yes, the Alysons are that good. Suffice to say, when I had to let the Alysons go and I returned to my reference, I was somewhat surprised to notice that in some small ways, I missed what the Alysons brought. Specifically, they might be a little more resolving in the upper mid-range and treble frequencies. Of course, that comes at a cost in terms of bass resolution and sheer body which the Vons excel at in my room but then, you can’t have everything. Josh might say otherwise – he has plans for an upgrade that will replace the Alyson stands with a woofer module that might just be the icing on the cake. Shortly after returning these speakers, I heard them again at this year’s RMAF where Josh had them paired with some super expensive Constellation monoblocks. It was fascinating to have another chance to hear the very same pair I reviewed with new amps and a new room after months of home use. While people always say that show conditions are a terrible way to judge products, that did not apply here. If anything, the Denver set-up sounded better than I had imagined it could. Sure, we were talking $50k+ amplification but the Alysons rose to the occasion and I was not the only person impressed at the show. They simply sounded superb. At $8250 a pair, these speakers get you into a level of reproduction that for many will be all they ever need. 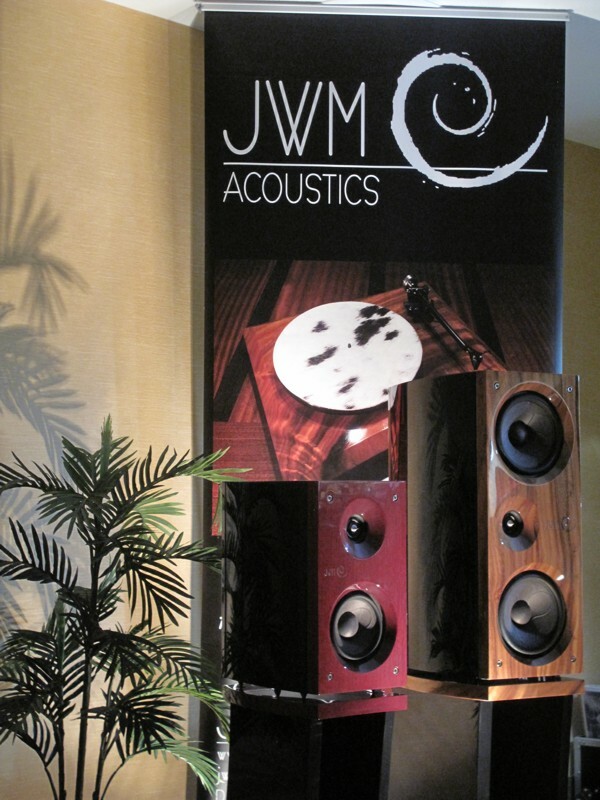 Keep an eye on JWM Acoustics – in my view their products are very special. Amplification: PS Audio BHK300 monos, BAT VK500 SE. Cables: Spectron Thunderbolt, Wireworld Platinum, and Absolute Fidelity power cords, Von Schweikert loudpseaker cables, PS Audio, Harmonic Technology, Purist Audio, and High Fidelity interconnects. The best RMAF to date! Terry says she has never heard better sound at a big show. Peter Breuninger, Terry Eringi and Kemper Holt report on the show. Please visit http://www.avshowrooms.com and http://avshowroomsforums.com for the best high performance product videos and forums on the Internet. "You are the real MVP"
LeBron James could win the NBA’s league MVP every year, but he doesn’t. Yes, I’m talking about Doug White of The Voice That Is! and his extremely consistent and soundly dominating Tidal rooms. However, this year’s Audiophile MVP goes to the Al Stiefel Legacy Room #2018 of the above mentioned brands. JWM Acoustics and Aries Cerat along with friends put forth a FLAWLESS room and presentation. Sound was as excellent as anything at the show, including systems that cost nearly a half million. It’s a room I feel that people will be talking about for many years to come. Hopefully, an listening experience I can repeat at AXPONA or Capital Audio Fest in the future (hint hint Josh and Josh). 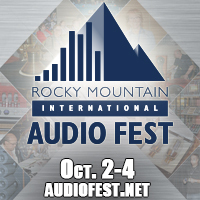 Many showgoers were visiting the room three or more times during the Rocky Mountain Audio Fest weekend. Doing so almost seems necessary once you start to consider prices of the assembled components at play. Your ears cease to believe what they are hearing. The Presentation: JWM Acoustics Alyson AML II Large Monitor loudspeakers ($8,500 USD). What started out as a near-field monitor. Now a convincing in every way that you are listening to a large tower when it comes to bass extension monitor, but not as convincing as a “you are there live” tower can deceive you to believe. But as far as large monitors go, it’s as delicious and full as anything I’ve heard with a lower frequency response starting at only 35hz. The Transmission: Douglas Connection speaker wires, interconnects and power cables. Worth mentioning because without who knows how awry this room might have gone, so better to be safe than sorry. Especially when you receive the price sheet and read that their Alpha 12 PCOCC Speaker Cables start at ($1,478 – 6ft pair) and that everything else seems to go down from there. (Note, Douglas Connection cables were used in the Legacy & Raven room as well). The Interpretation: Aries Cerat DAC and preamplifier. Utilizing a very stout Kassandra series Ladder DAC, along with their similarly dressed Incito preamp you’d think Aries Cerat might be my new favorite electronics company. When the MSB Technologies room right down the hall has me bouncing back and forth between these two rooms, you know I’m impressed. The Information: When it came to analog sources, extracting the information was again JWM Acoustics at the helm. Showing three turntables, the KAREN 3 SE ($1,850 USD), the KAREN 6 SE w/ Karen Control ($2,650 USD), and the KAREN 12 w/Karen Control ($6,000 USD) each outfitted with Etsuro Urishi phono Cartridges. Everything assembled in this room lead to a conclusion that all of the audiophile acrobatics you could perceive were easily capable and on display. Few systems in my mind come as close to projecting a solid checklist of everything the audiophile looks for, then with a quick swipe of the pen, checks it off. JWM Acoustics of Austin, TX was chosen by the Colorado Audio Society as this year’s winner of the Al Stiefel Legacy Room award. Joshua Miles, owner, is the engineer and designer of JWM Products. His Alyson Monitor speakers sell for $8,500,which seems surprisingly low considering the cabinets are handmade. The speakers were driven by the Aries Cerat Diana Forte single-ended 60Wpc Stereo Amplifier that sells for $28,500 and the Impera II Signature preamplifier that goes for a whopping $82,500. The Aries Cerat Kassandra Reference DAC MKII for $35,000 provided the source. The sound of this system was one of my favorites at the show. It had satisfying rich tones with more and better bass than I would have expected. While detailed and transparent, this was a system that drew attention to the music and not itself. I found myself very impressed! I spent some time in the Believe High Fidelity room where I got the chance to listen to the JWM Alyson AML II Large Monitor ($8,500) and the JWM Karen 12 turntable ($6,000). The other front end components were the Aries Cerat Kassandra DAC ($35,000) and Impera II preamp ($82,500). Power courtesy of Constellation mono blocks, wowza!! We auditioned some sparse and airy vinyl. What I heard was impressive macro dynamics with clean treble that was in no way “hot”. These are very smooth up top. The room loading was not ideal which led to a slight thickness in the bass but the bass extension was much more than I expected. I was blown away by what I was hearing in a relatively compact form factor. These speakers could fill a large room. A digital percussion track really showcased the dynamic abilities of this amazing system. I could happily live with this for the rest of time. Each year, in honor and remembrance of her late husband and RMAF founder, Al Stiefel, Marjorie Baumert donates one exhibit room to support "…a new manufacturer with an innovative product, or one who simply needs a little help." This year, The Colorado Audio Society selected JWM Acoustics of Austin, Texas to be the ninth recipient of The Al Stiefel Legacy Room. JWM also exhibited at RMAF 2016, when there were fewer RMAF rooms to cover, so at that time I was able to linger, for a full half-hour, in JWM's warm bath of good music, fine sound, and the extremely enjoyable company of Joshua Miles, owner, engineer, designer, and dreamer behind JWM Acoustics—and his mother, who is a most charming and knowledgeable partner in the JWM enterprise. The three of us sat together and discussed music and the art in Joshua's portfolio: Mr. Miles not only makes fine loudspeakers like the large Alyson Monitors ($8500), and turntables like the Karen 12 SE ($6000) and the budget Karen 3 SE ($1850), and accessories like his Cable Cradles ($80-100 per set of four), he also makes fine art paintings—and good vibes. The Jane JKM is Mike's most ambitious speaker representing the culmination of a decade of R&D and design iterations. Full range 3-way in a sleek tower configuration the no holds barred design brief evidenced by the large external crossover enclosure. In addition to freeing size limits on the components and layout the crossover allows Joshua to tune the bass to the owner's room. Auditioning Joshua Miles' gear is always a two-stage process for me. First the visual overwhelms the aural as I marvel at the effect of his craftsmanship and industrial design resulting in gallery worthy objects. Photographs can only hint at the depth, subtlety, light, and color a Joshua Miles' object presents to delight your eyes. Once reacquainted and past the object's styling and finishes I focus on the music they make. And for the third year in a row it is confirmed Joshua's design chops are not limited to the visual. Both his speakers and turntables are easily in the top ranks of those practicing the high end HiFi arts. Artisans working at the pinnacle of their craft have a deep understanding of the materials with which they work. Speakers and turntables are all about vibrations some musical and needed others literally unwanted noise. Joshua knows how to take the wood and other materials he works in to manipulate those vibrations crafting musical works of art. If you are in the market for speakers or turntable a must audition. JWM Acoustics (www.jwmacoustics.com) was back with Joshua Miles' stunningly beautiful speakers, turntables, and accessories. Walking in their suite was just like last year "you had me at hello" Joshua after one look at the artisanal staining and polished lacquer over woods on JMW products. Both the ALYSON AML and NET-1 speakers were available for attendees to audition. Listening reconfirmed that at JWM Acoustics music reproduction is a perfected blend of the accuracy, detail, and information dense high-tech school with the rich tonality and emotional connection of the music-is-beauty-and-truth design ethos. A very detailed listening report can be found in my LSAF 2015 show report. The executive summary is JWM Acoustics speakers are extremely transparent revealing a wealth of musical detail without every sounding anything close to strident or hard. Off a foundation of balanced tonality both dynamic range and bass depth effortlessly exceed what one would expect for the enclosure sizes. On the analog source front another year on from their debut JWM turntables are matured featuring less and less Rega more and more JWM; for example the main platter bearing has been upgraded from the previously used part. What has not changed are the stunning hardwood plinths into which it is mounted. Joshua Miles brings an interesting combination of artist and designer to the creation of his products. As an example the new Karen 12 turntable being introduced at LSAF fronting one of the Raven systems. Its gorgeous red plinth is bisected with contrasting darker wood inlays. First impression might be the inlays are Joshua showing off his amazing woodworking and finishing chops. The delightful contrasting wood grains are certainly no accident, obviously selected with an artist's eye. The function beneath the beauty of the inlays is revealed when Joshua explains how the selected wood, its location, and grain orientation stiffen the plinth improving its function as a platter bearing and tonearm platform. In their accessories line JWM introduced wooden head shells cobranded JWM/Ortofon with whom Joshua enjoys a close working relationship. This expands their existing line of cable lifters and record weights to include head shells. 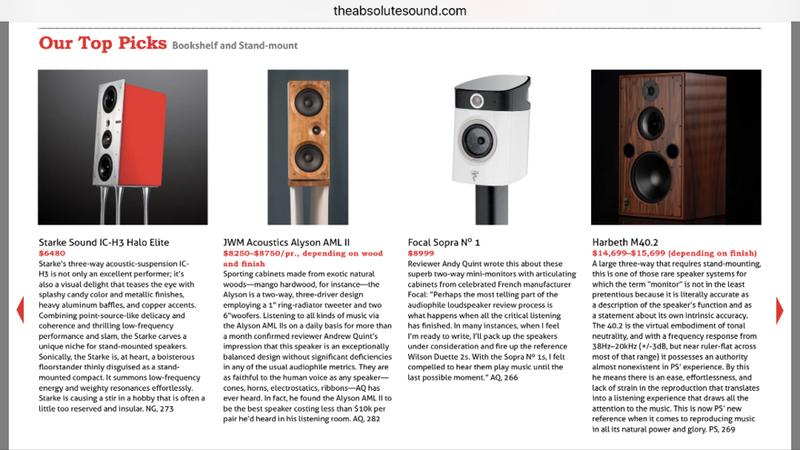 This review examines the performance of the JWM Acoustics Alyson AML loudspeaker designed as a reference level transducer. "Designer Joshua Miles has succeeded on many levels in creating the Alyson AML and bestowing on it a seductive, lovely voice that sweeps the listener away to joyful late-night listening sessions." The JWM Acoustics Alyson AML is a transducer designed to serve as a reference for sound engineers and discerning music lovers. JWM Acoustics hand crafts each speaker, and every component of the design is individually checked for superior performance. The Alyson began as a true monitor for recording engineers, but the design has been re-done for home music listening. The original Alyson was front ported so it could be accommodated in a recording studio monitoring booth. For home use the port has been set to the rear of the speaker. The design is the culmination of designer Joshua Miles 30 years of building speakers for bands, home audio, and pro audio use. JWM Acoustics is a small company located in Hawaii, and Austin, Texas. The JWM Alyson AML is a two-way design utilizing a modified 1 inch Scanspeak tweeter and two 7.5” Scanspeak midrange/bass drivers. I have favored two way designs in the past for the coherence that they offer. With a two-way the speaker has less drivers to blend, less complex crossovers are needed, and the result is usually a more natural reproduction of sound. The drivers are mounted in a D’Appolito alignment on the baffle. I asked Joshua Miles about the off-set tweeter. He said that during the design stage of the speaker, he was not happy with the way the drivers were blending. When he tried moving the tweeter closer to one edge he found that he not only liked the way the speaker drivers blended, but he found that he improved the soundstage as well. This happened by placing the loudspeakers with the tweeters to the inside of center. The diffraction from the outside edge gave a wider soundstage to the sound. The drivers are sourced from Scanspeak in kit form and Joshua hand assembles the drivers to his spec. With careful craftsmanship Joshua can maximize the basic driver design and shape it to the sound he desires. His crossovers are hand-tuned for his finished drivers and cabinet. The cabinet is tuned as a transmission line and bandpass to achieve the best performance from the modified drivers. When I took the Alyson’s into my listening room I placed them about 18” from the back wall just inside of where the Klipsch Cornwalls are located. I had ordered a Rotel RB-1552 MK2 amplifier to compliment my Rotel RC-1590 pre-amp. Excited to hear them I tried the Alyson’s with my 3.5watt SET tube amp. I put on Joni Mitchell’s Court and Spark album (Asylum 7E-1001 LP), an album that I have enjoyed over the years. What I heard surprised me in a good way. The sound reminded me of the time when I was listening to the album in the late 1980’s on the original Infinity RS 1 monitor speakers driven by Audio Research tubes. Older audiophiles will remember the Infinity’s as a state of the art contender. It was a smaller version of the monstrous Infinity IRS. Like the IRS the RS 1 had four towers, two for the servo controlled woofers, and two for the panels that held the famous EMIM midrange and EMIT tweeter driver arrays. I was reminded of the Infinity RS-1 speakers because of the transient speed I was hearing from the JWM Alyson speakers. The original Infinity EMIM and EMIT drivers were an attempt to deliver the transient speed of electrostatic speakers but with better dispersion and more power handling capability. At that time, I thought they were just awesome sounding. Eventually I moved from my Rodgers LS 3/5A monitors and Acoustic electrostatics to a pair of Infinity RS IIb. I kept this speaker as my reference for some years. I was struck by the similarity to the Infinity’s because I do not hear this kind of transient speed from dynamic cone speakers. The ability of the Alyson to deliver this kind of speed made for a very lifelike and compelling audio experience. I was also surprised that I could get satisfying levels of sound with the small tube amp. I did not try to push the sound too much and with less dynamic material, but I felt I got a good taste of what this speaker is about right away. When I received my Rotel amp I took my Klipsch Cornwall’s out of the room and I continued my critical evaluation. A few weeks later Joshua Miles stopped by to pick up the JWM Acoustics Karen turntable and to see how the Alyson’s were sounding at my home. We adjusted the speaker location slightly, but overall Joshua was pleased with the sound. He brought with him some recordings from MA records that he uses for evaluation. One of the LPs was a beautiful flamenco music recording that was recorded in a large warehouse that somehow had water on parts of the floor. Surprisingly through the Alyson’s I could hear the echo and wet feel of the venue. Joshua was quite impressed with the sound. In fact he was very surprised at how well the Rotel amp/pre-amp sounded. I know they are not as good as Joshua’s top of the line BAT tube electronics, but I like how musical they sound and Joshua agreed. Good job Rotel! During Joshua’s visit I commented that I thought the speakers had healthy output into the 40-30hz range. Joshua said that he has been able to get output to a flat 25hz in certain rooms. I decided to test this out. With the aid of one of my buddies from the River City Audio Society, we performed a frequency sweep of the speakers in my room. I wanted to verify that the Alysons were indeed putting strong content in the 35Hz range in my room. With the aid of one of my many audiophile friends from the River City Audio Society, Matt, we were able to get a measurement in my listening room using new soft-ware from REW Room EQ Wizard. The following are screen shots of the frequency response. The unique sonic signature of my room aside, I was surprised to find that we measured a lower response from one speaker (this is due to room acoustics and speaker placement). The Left Alyson had strong bass to 25Hz. Very impressive indeed! The Right speaker had strong bass output to 32Hz, still very respectable. This image shows the combined response of both Alyson speakers. Carefully placed I would think that the potential owner of the Alyson’s should get full range performance in their listening room. Enjoying the easy naturalness of the sound I decided to try Mozart Violin Sonatas on CD (Deutsche Grammophon B0004771-02 CD). Featuring two youthful female performers, Hilary Hahn and Natalie Zhu, this CD is both delightful and inspiring. The JWM Alyson’s showed just how deft Ms. Hahn is on her violin and how Ms. Zhu’s fingers fly on the piano keys. For critical evaluation I like to hear how a component presents the sound of a piano. Aside from the piano being one of my favorite instruments, I also sing in a choir every weekend and I am blessed to hear talented players on a grand piano. In addition, my son and his girlfriend from next door play our piano almost every day. So, if a speaker does not do a convincing job on piano no matter what else it does well, I just dismiss it. I had in house a bookshelf monitor recently from a respected high end manufacturer that although it did many things well, they had problems reproducing the continuity of tone in the upper registers of the piano. This alone made the speakers unacceptable for me. So how did the JWM Alyson’s do? Fabulous! There was a sense of weight and the piano sounded like it was one organic, connected instrument. A highlight was how the Alyson’s reproduced each note in space while Ms. Zhu was flowing though the music. It showed just how incredible of an artist she is. I could hear the strike of the hammer on the strings and then the ring of tone that is produced from the string as it reverberates in the body of the piano and onto the top board. It was if I could see the delicate hammer strikes coming from Ms. Zhu’s fingers. Violin tone meanwhile was sweet and resonant. The vibrato from Ms. Hahn’s finger work on the fret board made the notes soar. All the while, the speakers also reproduced the acoustic space in which the recording was made. The Alyson’s proved themselves as superior transducers of acoustic music. I thought the Alyson’s did a superb job of delivering the weight, heft and most impressively the tone of the string basses. Ms. Davrath’s voice and her wonderful technique was gorgeously reproduced. On the opening track the music is thrilling. It has a dance like cadence and on the Alyson’s the beat is jaunty and lively. Most of the music on this LP has a dreamy quality and in a relaxed way I could follow each musical line. As I listened to the album I kept thinking how exquisite the sound was from the orchestra and the soloist. It was like a well-made meal where very bite reveals something new and delightful. What a treat to listen to this music on the Alyson’s! Los Lobos album, La Pistola y El Corazon (Slash/Warner Bros. 9 25790-2 CD) features a type of music that I have heard since I was a young boy growing up in El Paso, Texas. The album features energetic performances by the band and the JWM Acoustics Alysons showed this off very well. On the track El Gusto the rhythmic flamenco strumming is rendered so you can hear not only the strings but the fret board and the top body of the guitar. David Hidalgo’s violin playing is fluid and floats in its primitive, non-classical style. On my favorite tracks, El Canelo and La Guacamaya, David Hidalgo soars on his requinto guitar. The bird-like chirping sound of the requinto is remarkable on the Alyson’s. You can hear the initial strike on the string as well as the ringing harmonics afterward on each successive note. On lesser speakers this effect is blurred, but on the Alyson’s, it is so distinct that it sounds like Mr. Hidalgo is playing faster. As I listened I thought the whole ensemble is sounding like they are playing with more pep through the Alyson’s. The sound brought back memories of my grandmother’s Rompope (Mexican eggnog) and Mexican Coco. Through the Alyson’s this music had an infectious bounce that added such snap and joy to the music that it was delicious. I have been a big fan of King Crimson since I first heard their great hit, 20th Century Schizoid Man on the radio. I was barely teenager then, but throughout high school I continued to buy their albums which I still have! As the years passed Robert Fripp reissued their earlier albums of which Islands is one of my favorites. When it was announced that Fripp was reissuing the back catalog for a 40th Anniversary edition on CD and DVD audio, I had to have it. Even though I have 4 different copies on 2 different mediums. Crazy I know, but I love this music. So I ordered Islands (KCSP4), and if you are a fan you should too. On Formentera Lady I could immediately hear an improvement on the sound. The bowed string bass sounded like it was played with searing intensity. Harry Miller’s opening string bass solo announced that the band was not kidding around, there was a sense of urgency to the playing. The bowing sounded like it was carving out the low notes as the stings buzzed resonantly on the fret board. The flute was sweet, piano gorgeous. Mel Collin’s singing was immediate with good sibilance. I had no problem understanding Pete Sinfield’s lyrics. When the drum came in the snare had brilliance. When the bass was plucked there was no muddy overhang (which was a terrible problem with an earlier remastering). There was much improved clarity and I could hear the dense layering of sound that King Crimson created for this brilliant album. As the song progressed I felt like the lyric, “Odysseus charmed for dark Circe fell”. Except I was falling charmed for the exceptional sound reproduction of the JWM Acoustics Alyson AML. The sound of the 40th Anniversary Islands reissue is spectacular on the Alyson’s. By the time the title track ended I was convinced that this is the definitive re-issue of this classic. 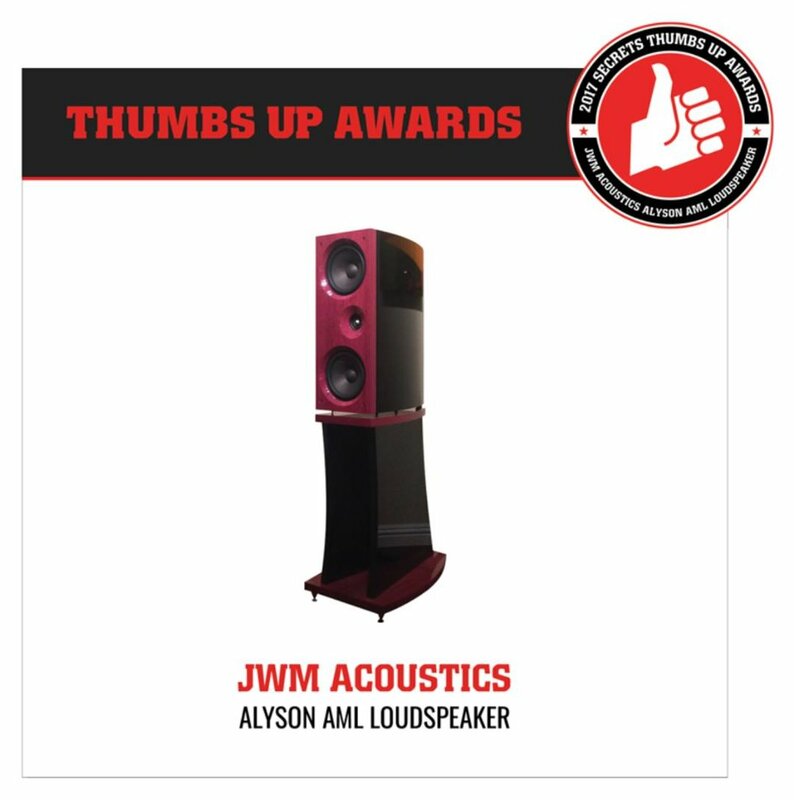 Although I have heard larger, more expensive speakers THE JWM ACOUSTICS ALYSON AML is certainly the most musically satisfying speaker system I have ever heard..
As a reviewer, I try to temper my enthusiasm for an audio product and I try to be as objective as I can. It is easy to become attracted to something new or different. With the Alyson’s this was no different, but I found myself smiling in joy when listening to them. From the first time, when I heard them at Joshua’s home in Austin till the time they arrived at my home I was drawn into the music. The JWM Acoustics Alyson AML have some unusual strengthens. As I spent more time with the Alyson’s I came to the realization that the Alyson’s are the most coherent speakers that I have ever heard. They sound even more coherent than full range electrostatics. I think that is because they present a consistent tonality across the frequency of the music being reproduced. Coupled with the superior rhythmic timing and the terrific dynamics of the JWM Acoustics Alyson AML design the music is presented as a complete organic whole. The speaker is elegant in its reproduction of harmonics. The JWM Acoustics Alyson AML offer full range sound, stunning transparency, and wonderful musicality. They play loudly without strain, they have a nice boogie factor, and they allow you to feel they rhythm of the music. Are the JWM Acoustic Alyson speakers the best I have heard? In many respects, yes! There are larger speakers that in larger rooms will give a bigger presentation. Big horn speakers will of course edge them out in dynamics. However, the JWM Alyson speakers are the most musically satisfying speakers I have ever listened to. They also represent a superb value at their asking price, especially when you consider the workmanship and the sound. I highly recommend the JWM Acoustic Alyson’s to dedicated music lovers. They are a joy to experience. JWM Acoustics is a small, custom audio manufacturing firm located in Hawaii, and Austin Texas. Joshua Miles is the owner and master builder. He is also a successful sculptor who works with ceramics and wood as his canvas. Joshua Miles also happens to be a very passionate audiophile who blends his love of art and music to create unique musical reproduction machines. His product line includes studio monitor speakers and turntables of which one, the Karen 6 is the subject of this review. I met Joshua when he attended a party for the RCAS audio club that I was hosting. It was there and then that Joshua and I shared our love for big horn speakers and vinyl. Joshua kindly allowed me to review his middle of the line turntable the Karen 6. The Karen 6 is a hand built turntable that sources it’s tonearm and platter from Rega, the motor and subplatter from Tangospinner, and the wood for the plinth from rare species of wood from Hawaii. The speed control box is sourced from Rega too, and encased in similar wood to the turntable. Modifications are done to the circuit to improve the speed performance of the control box. A record weight from Tangospinner is supplied to help flatten records to the platter. The cartridge recommended by Joshua is from Ortofon. My sample came with an Ortofon Black. The design of the Karen 6 begins with the tone arm, the excellent Rega RB 303. Many years ago the company Rega invested research and money in the development of an affordable tonearm capable of performing as well as the best available. They developed an award-winning design that through masterful engineering created a tonearm tube made of one continuous piece of aluminum. Beautifully balanced and featuring precise bearings the arm became a legend in the industry. The Rega RB 303 is the current model of that legendary tonearm. What it does well is that it realizes near perfection in analog playback. In use the tonearm has almost frictionless movement up and down and side to side, with very little play. What that means is that the tonearm will hold the cartridge’s stylus in the groove properly during playback. Joshua Miles expertly mounted an Ortofon Black cartridge on the arm for me to use. Joshua Miles hand crafts the most beautiful plinth I have ever seen. The lucky customer gets the opportunity to select rare woods like Monkeypod, Sapele, and Wenge sourced from Hawaii as the plinth. Drawing from his experience as a recognized sculptor using wood and ceramics he creates a unique and visually appealing base for the turntable. Using an accelerometer Joshua Miles has determined the design and the shape of the angles of the plinth for best sound. The Karen 6 turntable is beautiful and functional. A cross section of Sapele are used on my sample. The different density and structure of the Wenge and Sapele helps control the unwanted vibrations from reaching the tonearm and stylus. The bearing is made of hardened stainless steel as is the subplatter and the two are sourced from Tangospinner. The motor has more torque than my Rega RP 6 and three belts used help stabilize and dampen the vibration from the motor. The speed control box from Rega is modified as well. Wenge and sapele are used for the housing. Internally, Joshua replaces critical components for improved sound. The platter is the same one from the Rega RP 6 that uses the float glass outer flywheel. A beautiful solid aluminum clamp and feet also sourced from Tangospinner finish the turntable. Joshua kindly set up an Ortofon Black cartridge on the tonearm for me at his work space in Austin. When I got home I re-checked the tracking force (set to Ortofon’s recommended 1.5 grams). I set the Karen 6 on top of my equipment rack next to my Rega RP 6. What a unique visual analog fantasy this was! The handsome and exotic looking Karen 6 next to the neat, and beautiful industrially looking Rega RP 6. Joshua had told me that the turntable was new and had not been broken in. He recommended that I run the turntable for 24 hours straight to help break it in. The Ortofon Black was new as well and from experience I knew I had at least a few weeks of break in on it before I was to begin critical listening. So I plugged in the Karen 6 to my new find (a Threshold FET 10 phono stage) and began to play records on this amazing machine. One thing I noticed was the smooth rotation and start-up of the platter, no doubt the result of the up-graded motor and triple belt pulley system. I put the solid metal clamp weight down on the record and let the music play. Having owned many Ortofon cartridges over the last 35+ years of music listening I have become familiar with the “house” sound of the Ortofon cartridges. I would say that what you will generally hear is a very clear sound that emphasizes the high frequencies, and this is what I believe you get with the Ortofon Black cartridge. Within a couple of weeks, I had switched to the phono stage in the Rotel RC 1590 preamplifier. I thought that the smoothness of the highs that the Rotel displays was a better musical pairing with the Ortofon Black cartridge. I had received in time for review the excellent Rotel matching amp the RB-1552MII. This gave me a solid state alternative for my Klipsch Cornwalls. I normally listen to a custom modified vintage Magnavox SET tube amp. To warm up I put on an old favorite, Secrets (Elektra EKS-75049) by Carly Simon. Even at a low level (55-68db at listening position) I could easily hear the orchestration and I didn’t feel like I had to “turn it up”. I could hear the delicate ring of the acoustic guitar. Noise level was impressively low, and this allowed the music to flow beautifully from the speakers. At a low level I could distinguish the fine details of the orchestration and the phrasing of Carly’s delivery. I could hear the delicate ring of the acoustic guitar. If a recording is reproduced well like it was you can hear distinctly the sound of the pick as it glides across the guitar strings. There was also a bell like quality to the ringing strings and the notes and harmonics floated out in space. On voices I could hear Carly’s use of her mouth and tongue to form the words. I could hear her artistic use of head resonance to add meaning and emotion to her music. This was especially evident on the song “The Carter Family”, and her signature track “You’re So Vain”. The clarity of the instruments and rhythmic flow was so good it became intoxicating to listen to. “This is what High End and Vinyl sound are all about”, I thought to myself. As the entire side of the record danced across my listening room I was left wanting more of that beautiful music reproduction. I decided to keep in a folk-rock vein with a female lead, Court and Spark (Asylum 7E-1001) by Joni Mitchell. I also decided to try the Threshold FET 10 pre-amp with the Karen 6 again. Experienced audiophiles know that audio equipment needs break-in time to sound the best. The Karen 6 and Ortofon Black are no exception. It took three months of constant playing to get to this point. Since the turntable now had some break-in time I felt I should try it one more time. On the Court and Spark LP, I noticed a smoothness and relaxed detail that was wonderful. The slight irritating high frequency glare was gone, replaced a compelling immersive sound field to get lost in. I could easily follow the lyrics, which on lesser equipment is shaded or obscured. The reproduction of Joni’s voice was presented in a rounded, fleshed out way. As her voice floated between the speakers the presentation was so vivid that it touched my soul. There was a sense of precision and authority to the music reproduction from the Karen 6. Records just kept spinning, one of those was Uomo di pezza (Phillips 6323 013 L) by Italian Prog group Le Orme (The Footprints). This is a very well recorded progressive rock album (my copy was purchased in 1973). I always loved the spacious and warm sound that preserved the textures of the voice and instruments. The record has sounded almost 3 dimensional and with the Karen 6 in the system it was striking. On the opening track Una dolcezza nuova, the weight and power of the percussion and organ was thunderous, while the piano played sweetly on the opening track. The art work on the album is other worldly and the playback on the Karen 6 re-enforced that quality. On Giambo de Bimba the voice of Aldo Tagliapietra had a sweet, rhythmic balance. It was as if you could use his voice to describe what “singing” is all about. What I mean is that the tone of the voice was beautiful and there was a silky smoothness and wonderful musicality to the sound. The bells and the strumming of the guitar on this track rang out with glorious joy. Listening to the Melody Gardot LP, The Absence (Decca 3700328) the Karen 6 kept the rhythms of the different instruments separate but together in time. On the track Amelia when the chorus came in I was startled because the voices seemed to come from the next room (my listening space has an opening to the kitchen on my right). Again a very holographic and warm sound emerged from the speakers. This is stereo at its best I thought. Switching to a pair of B&W CM6 the Karen/Ortofon Black sounded fleet of foot. The minute details of the layered instruments emerged with an immersive, sweet presentation. The Karen exhibited precision, speed, detail. The Karen/Ortofon Black allowed me to hear the fine details of the recording easily, while still maintaining a musicality that touched my heart and soul, and put a smile on my face. Thinking that I had finally broken in the Ortofon Black cartridge and Karen 6 turntable I switched speakers again. This time I used the JWM Acoustics Alyson (review to follow) studio monitor speaker system. Wow, the best sound in my home I thought. Having binged on recent reissues I splurged on the new Mobile Fidelity 45rpm Kind of Blue (MFSL 2-45011) by Miles Davis. Having heard this record countless times in the past, it is still one of my favorites. I poured myself some coffee, lowered the tonearm and sat down for a listen. “So What” and “Freddie the Freeloader” are familiar tunes, but it was like I was hearing them for the first time. Subtle phrasing, and quick flourishes appeared and disappeared in space, and I thought I never heard that before or at least in this kind of way. The Karen 6 provided a silent, black background. Kudos to Mobile Fidelity, but also to the Karen 6 turntable and Alyson speakers. The sound was vivid, live sounding with astonishing dynamics and clarity. Timing was superb, I had a hard time sitting still as the rhythmic pulse made me want to tap my toes and shake my booty. This musicality of the reproduced sound was an experience that made me want to stay up all night listening. THE JWM KAREN 6 is a Solid, Beautiful Hand Built Turntable That Offers Quiet, High Resolution Playback for the Most Discerning Audiophile and Represents a Terrific Value for the Selling Price. Rejoice! If you love vinyl like me, then I say we audiophiles are living in a golden age. There are many new recordings and reissues of past classics on LP available now for the music lover. The same goes for new, modern turntables. 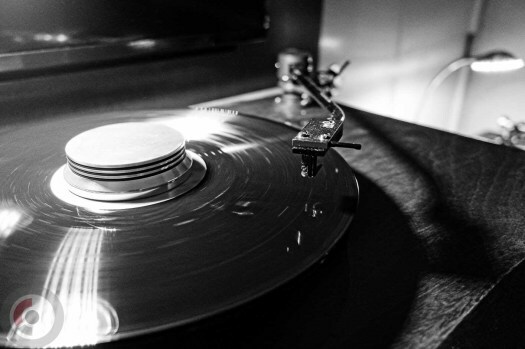 To be sure, older, classic turntables can be reawakened to elevated performance from a new cartridge upgrade. However, newer turntables from VPI, Rega, Project, and now JWM Acoustics offer a higher level of performance for the music enthusiast than ever was possible before. In this light the JWM Acoustics Karen 6 represents a tremendous value for its selling price of $2300.00, and is in my opinion a bargain for the serious audiophile. The Karen 6/ Ortofon Black combination offers musicality and soul when reproducing records. Adding to the spectacular performance for the price the proud owner will also have a limited, customized, and hand built turntable. The look, appearance, and finish of this turntable is unsurpassed. Rejoice, for you may find as I did in rediscovering my favorite LP’s from decades past that you are indeed fortunate to live in an era of sonic vinyl playback excellence. I highly recommend the JWM Acoustics Karen 6 turntable for the most discriminating music lover. I had a Shanti-like good reaction to my first experience of JWM Acoustics of Kailua, Hawaii when I encountered them at T.H.E. Show in Newport this past spring. JWM would stand for owner/designer Joshua W. Miles, who made it further east this time to Denver. Handsome Josh has several products named after the ladies; the Jane and Alyson Loudspeakers, and Karen Turntables. Are there more to come? Actually I gave Joshua a productive marketing concept; when Obama retires to Hawaii JWM has to be ready with a "Barry" speaker model. But until then I am here to tell you these are some of the prettiest speaker gals you are likely to come across, with beautiful hand-crafted made-in-Hawaii cabinets that sound great, and look awesome! I heard from the Alyson AML Large Monitor ($5400/pair) a lovely, stand-mounted, two-way ticket to ride including dedicated stands. The Alyson moniker turns out to refer to the designer's sister, who Joshua describes as "a small woman with a powerful influence on me . . .Not a single piece in this system is over or under built. It is just as it should be. Like my sister." JWM also offers the slimmer Net-1 minimonitor ($4012/pair). Turns out that Net is not some web-based acronym, but a nickname for JWM's wife, as in Jeanette. In between speakers and source JWM was running some fine electronics from Balanced Audio Technology, including their BAT REX preamp ($19,000), BAT VK-P12SE Superpack phono stage ($12,000), and BAT VK655SE power amp ($16,500). Paddling our board upstream gets us to the lovely looking JWM Karen Turntables, models 3, 6, and 12. Catchin' the wave gets you many a night with the Karen 12 Turntable and Karen Control ($4500). Turns out that Karen is the name of Joshua's oldest sister, and that during the design of the turntable he was searching for a sound that was "Warm and rich but clear and concise. Just like the sound of my sister's voice." And pretty Karen 12 was wearing an Ortofon Windfeld MC Cartridge for our date ($2500). What can possibly do justice to this high-end family listening-wise? I heard, as Karen and I were getting to know one another, a recent 45rpm Analogue reissue of "Dream With Dean" and the standard "Fools Rush In." The smooth-breaking sound-wave sets were as tubular and rich as a good Mai Tai or Zombie served on the beach. "Mahalo" JWM Acoustics. Net, Mom and I can’t thank you enough for taking the time you did to visit our room. I know it was only brief, but I’m so happy you could at least get a feel for what we are doing out on the islands. Your visit alone was more than a comfort to our little company. To be honest, it was an honor to have you come in. We have only attended three shows now and to have an encounter with you was fantastic. 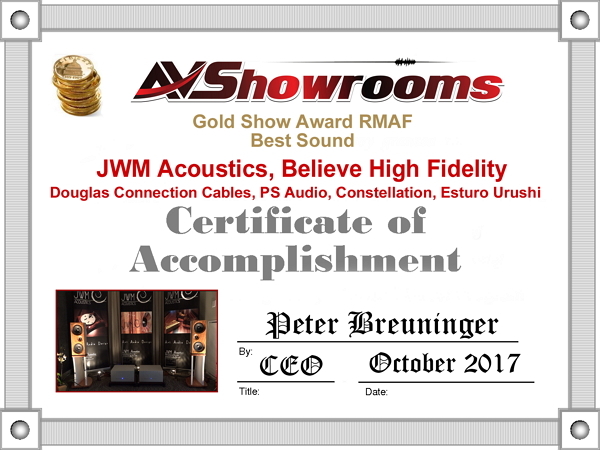 I assure you JWM Acoustics is here to stay and will continue our quest for the most beautiful products and most natural sound on earth. These beautiful speakers are from JWM Acoustics in Kailua, Hawaii. The cabinets are made from woods like monkey pod, purple heart, and mango. The larger speaker is the Alyson AML which retails for $6,900 – $7,200 depending on finish. The smaller monitor is the NET-1 which retails for $4,900-5,350. Each speaker is handmade and they sounded excellent in the demo. Mahalo for including JWM Acoustics in this fantastic show report! As a small company on the rise, we truly appreciate it. AND NICE PICTURES! It was a delight to meet you both and we look forward to seeing you again soon. SM: I am glad to know that hard work still pays off in this country. At least if you live in Hawaii, like JWM Acoustics owner/engineer/designer Joshua Miles does. I really enjoyed my brief time visit to this room. Things felt, and are, made by hand. With really nice finishes on the speakers and turntables that Joshua designs. I heard the JWM Alyson AML, which is a 3-way floorstander ($6900/pair and up depending on finishes) and sounded very full-range, with a burnished warm dimension to the sound. Front end was the JWM Karen 3 turntable. Lots of wood and priced at an extremely reasonable $1500 with arm. JWM also offers several other models of speakers, but I did not hear these. Everything was being amped by a hefty and serious VK 6550SE amp ($16,500). A favorite room so far, in early innings. JWM: Mr. Matson and Stereophile Magazine! Your description of the sound coming from the ALYSON AML as “very full-range, with a burnished warm dimension to the sound” is EXACTLY what we are aiming for. Being accurate to the source does not mean that one needs to have laser beams aimed at their ear drums. Nor does it mean the need for 8 foot tall cabinets full of huge drivers. Especially for the recording engineer who must sit in front of monitors for 8 hours a day. Our speakers may have a pedigree that originated in the studio, but we feel that taking the studio-to-home approach in speaker design is working beyond our greatest expectations. HR: Joshua W. Miles is an artist. He showed me his paintings in a book and I loved them. His mother is a painter too. She was beautiful and I loved her smile and motherly ways. But, most of all I admired the shear beauty and luscious detail of the sounds Joshua's Alyson AML Large Monitors ($6900–$7200/pair) and custom Karen 6 turntable ($1700) were making in the room. In my notes I drew a picture of the loudspeaker with hearts and stars flying around it. Everything in the room except the Balanced Audio Technology electronics, Ortofon Winfield cartridge, and turntable hardware by Rega, was made "one-at-a-time" by Joshua's own hands. JWM Acoustic is located in Kallua, HI and specializes in using locally grown hardwoods to fashion one-of-a-kind custom loudspeakers and turntables that are tailored to each customer's desires. I walked out reminiscing about my own mother—she was an artist too. JWM: To you Mr. Reichert of Stereophile Magazine. “I’ll take hearts and stars all day long”! I can’t thank you enough for the amazing words in the Reichert Report. The description you used, “Luscious detail” nailed it. There is a secret place that exists somewhere near laser detail and a true warm live experience. We hope to bring each and every music lover into this place. 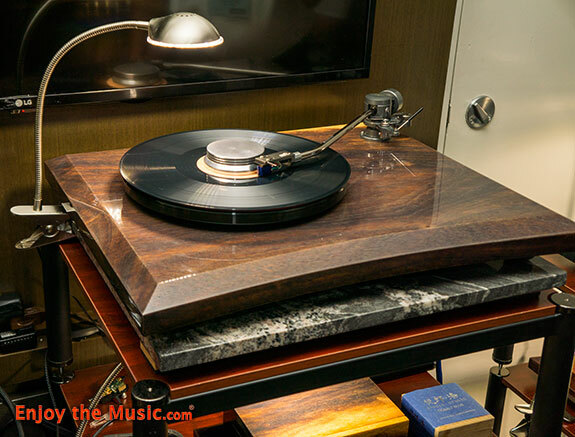 MK: Joshua W. Miles of JWM Acoustics is a custom speaker designer and turntable rebuilder hailing out of Hawaii. The gear was beautifully finished and sounded great as well. But what was a surprise was that without prompting he started talking about how they only use fallen wood and that they actively go out and replant trees. He also explained how being green was a guiding principle for him, not just because this is important on an Island like Hawaii, but also because it is simply the right thing to do. Now I hadn’t said anything about my interest in the same things before he started talking about using ecological principles in his manufacturing, so this was a pleasant surprise. I do hope to follow up JWM Acoustics as this is right in line with what we do here at GreenHiFi. I can’t thank you enough for the write up on GreenHIFI.com! Although we are not perfect stewards of the planet, by golly we are trying. My wife Jeanette and a few of her friends, including the amazing furniture maker Thorbin Wuttke, have truly influenced us over the years. They have made us aware of the simple things that anyone can do yet few bother to put in motion. For instance, saving our sawdust for the local farmers. We also create accessories such as Cable Cradles and turntable record clamps from the smaller cutoffs in the shop rather than discarding them. In addition we collect small scraps from other wood workers to be repurposed. As JWM Acoustics grows, we will continue to implement conscience practices to balance our production. NT: Let me begin reporting on JWM Acoustics with a disclaimer. What I discovered displayed in the Embassy Suites Carrollton Room pushed so many of my buttons aligning with what I personally want from luxury high end hi-fi that what follows is as much new convert gushing as detached objective reporting. The beauty of the product is immediately stunning. Determined not to be taken in by just another pretty face I tried to find fault with the sound or underlying technology and failed. My conclusion is I was looking at and listening to, especially in high-end audio's loudspeaker space, The Next Big Thing. JWM Acoustics loudspeakers line is presently three models deep. The two driver NET-1 monitor, the three drivers Alyson AML large monitor, and the four driver Jane JKM floor standing flagship. These were being driver by Balanced Audio Technology electronics, REX Preamplifier, VK-P10SE Phono Stage and the VK-655SE amplifier. Source for digital playback OPPO BD-105D as both disk and file player. Most of the time I listened it was in the analog domain using JWM Karen 3 or Karen 6 turntables via Ortofon cartridges. Cables loom by Nordost rounded out a system that should satisfy all but the most snobbish audiophiles bona fides. 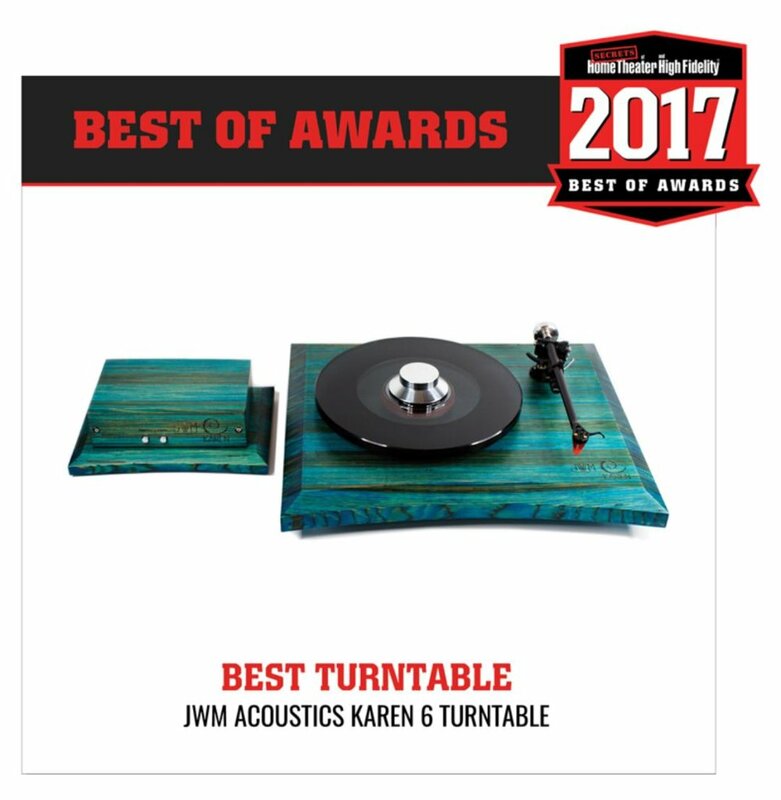 With JWM Acoustics at the front and back end of the demo system let's start at the front with the Karen turntables. Look at those curves and bevels. If you are as into fine woods as I am you have already noticed this is a different piece of wood and both examples are not just the next length to come off the raw board. Grain patterns like these are the result of a craftsman's eye selecting first the raw lumber and then where on the board to cut. Recovering my audiophile sensibilities it was apparent and confirmed by Jeanette Miles who was running my initial demo that JWM Acoustics bases the Karen turntables on OEM components from Rega. Subsequent listening showed the recipe of hardwood plinth and proven English platter, bearing and motor is a winner. The logo and model name of the Karen turntables and the speakers are cut into the wood and along with its fine grain and color sparkle out from under the finish. JWM Acoustics accessories include the Karen Control power supply for use with the turntable and the Cable Cradles cable lifters. I mentioned above, Jeanette Miles was running my initial demo and between records she was telling me about the products including explaining the design and build is the work of her husband Joshua. As it transpires the 'JWM' in JWM Acoustics are the initials of Joshua W. Miles. Prior to starting JWM Acoustics Joshua has excelled in multiple media in the fine art crafts including work in ceramics, sculpture, painting/lacquer work, and photography. His impressive resume includes fine arts degrees followed by work as a professional artist and teaching fine craft. I call my company Audio Crafters Guild because I draw inspiration from the Arts & Crafts movement of the late 19th and early 20th centuries. The legacy of that movement is the fine arts craft artists working today in wood, glass, metals, fibers, and ceramics to elevate the object to the level of art. Or shall we say bring art to the object? Hearing his resume while standing in the presence of and listening to the objects Joshua W. Miles created I understood why I was having such a strong reaction to what on one level are just another line of speakers and a couple of turntables. Sure and the three generations of Moulthrops just make wood bowls (link). So, let's check out Joshua's speakers. The Alyson AML close-up above is the only photo I managed to take that even hints at the beauty and fine craftsmanship evident in these speakers. The contrast between the color of the wood baffles and the black piano lacquered sides is stunning when seen in person. The optical flatness and polish of the sides and wood panels is the equivalent of what one sees on a high gloss finish optioned Yamaha or Steinway grand piano. The Jane JKM external crossovers each the size of a big amplifier speaks to the seriousness of the design intent. So, they are gorgeous, how do they sound? The short answer is if you are in the market for a pair of high-end luxury speakers put JWM Acoustics on your short list. Being audiophiles we are by nature borderline obsessive compulsive so I expect you would like a bit more detail on the sound. I auditioned the Alyson AML Saturday evening and NET-1 Sunday morning. Alas by the time I arrived the big Jane JKM had been relegated to static display due to simply not working in the room, drop ceilings and flimsy conference room walls the eternal curses of the hi-fi show exhibitor. First impressions of the Alyson AML were of a nicely balanced neutral and detailed speaker. No POW BANG ZOOM ZING beating the listener over the head. As Jeanette DJ’ed more album cuts for me I was more and more impressed. My experience is with top flight high-end speakers this is typical as so much of what one is paying for is what is not present. Chasing out extraneous distortions, noises, phase glitches, and resonances is expensive and time consuming. At first listen the effects these efforts yield are subtle because their absence has left more of the music and the brain's initial reaction is "sounds like music." The longer the audition went on the more impressed I was with the speaker's balance. High-end speaker designers walk a tightrope balancing hundreds of tradeoffs between a sound juicy with tonality at the expense of transparency vs. the all too common sin of hyper-detailed and transparent sound leaving tones bleached out. The Alyson AML and upstream components exhibited the fine balance of that tightrope successfully mastered. Audiophile disks showed expensive tweeters well served really are worth it with finely filigreed high notes and overtones and fast but not over sharpened transients. Deluxe pressing of Blue Notes let all sorts of delightful details of the instruments' sounds' and artists' intent shine through. Being a bit perverse in an anti-audiophile pro-my-music way when I spotted Jeff Beck's "Guitar Shop" LP in the stacks I asked for the song "Bigblock" to be played. Alyson AML morphed from sweet Dr. Alyson Jekyll into raucous Ms Hyde as Beck pounded out his homage to American muscle cars. So your audiophile speaker is full of exotic crossover parts and top line Scan-Speak drivers, sure but can it rock? At the drop of a hat Alyson downshifted and out poured the drum kit and the bass player locking into the groove and Jeff's Fender in all it's soaring sweet then grungy glory. Joshua Miles returned to the room just after our excursion to the land of the Guitar Gods. Shortly after our introduction as more audio show appropriate music played Joshua picked up the re-sleeved "Guitar Shop" and with dismay in his voice asked Jeanette "you played this!?!!" I found it priceless as I was pointed out as the culprit I swear he was holding that LP like a first time father holds a poop filled diaper. I was forgiven (I think) and we continued to spin disks on the Karen turntables and the occasional streamed digital file. Joshua DJ'ed and the music from the unscathed by her rough treatment Alyson AML poured out in the highest-fi. During this part of the demo between cuts and at the back of the room I switched out of music lover mode and into engineer geek pop quizzing Joshua about the design and execution of his speakers. What about cabinet resonance control? Multiple laminated layers of woods and damping material's. I believed him as they exhibited the boxless sound of speakers with low noise cabinets. Wondering if the exotic hardwood front baffle was an excuse to show off his woodworking talents I asked what about that wave guide around the tweeter? That answer was like a information flood gate had been opened as he pointed out the tweeter is further recessed better aligning the drivers' acoustic centers. I thought to myself that is a win-win with better phase integration between drivers and fewer crossover components to get there. Miles continued that with the drivers mounted between the outer hardwood baffle and inner sub-baffle he has designed a method to de-couple the drivers keeping their reaction energy noise out of the baffles further lowering enclosure noise. Spend enough time hanging out on diyaudio.com and you can talk the speaker designer tech talk too. While Joshua talked the talk his speakers walked the walk the highness of the fi serving to establish his credentials to me in real time. Just when I thought I had the measure of the Alyson AML Joshua tried a DSD track through the Oppo. The DSD streaming had only recently been established so I believe Joshua was as surprised and delighted as the rest of us when that cut showed the Alyson AML was effortless capable of another octave of really deep and defined bass. It is a class act (a.k.a. low bass distortion and excellent driver box parameters alignment) when a speaker can go that deep and you have no clue with typical program materiel and then along comes the deep bass and WOW. By then it was late Saturday night as I bid Jeanette and Joshua Miles goodnight with repeated congratulations on what they have accomplished for a young startup about to burst onto the scene. I had entered the Carrollton room while looking to meet up with other exhibitors and attendees for dinner. That opportunity was by then hours past so back to my suite for room service dinner just me and my system playing chill out music as I buzzed in the afterglow one gets after an unexpected encounter with the state of the art and its dedicated practitioners. Sunday at LSAF is a short show day. Most exhibitors are open for a couple of hours in the morning then pack up to be out by the noon checkout time. After showing the ACG room to a few more guests I packed it up. Had to stop by and say good by and good luck to Jeanette and Joshua. They were not packing up yet in fact something special was happening. Dave Thomas of Raven Audio had brought down his Blackhawk Limited Edition Amplifier and it was hooked up to the NET-1 speakers. Ignore five hour drive home and back to day job on Monday departure immediately postponed to check this out. There is no way that small a monitor on a 20 watt per channel amp should be able to fill that big a room with that much music. But it was. Tube watts are jumbo watts and the Scan-Speak drivers are known for punching above their weight class. No point in trying to figure it out I just spent the time luxuriating in the hi-fi as it communicated the music from the choice cuts filling the room. In a high-end audio world preoccupied with the massive statement systems this little pairing of Dave's Blackhawk and Joshua's NET-1 seriously asked the question "isn't this all you really need?" I give you the New Wave of Made in USA Hi-Fi. Raven Audio of Texas and JWM Acoustics of Hawaii. I had intended on apologizing to the Miles for taking this picture Sunday morning rather than Saturday evening when they were all dressed up for exhibiting. Jeanette had an especially pretty dress on. Then I remembered "they live in freaking Hawaii, island casual is what its all about." These are wonderful people deserving every success in the high end audio industry, but I'm taking back that apology. I have to admit, while Net read your amazing show report to me I had a tear or two well up in my eyes. You may or may not know this, but LSAF was the first of our very first three shows we had scheduled for the year. Actually our first mainland show EVER! To have you speak so fondly of our products means more than you will ever know. For you to recognize the hard work we put into the sonic qualities as well as the recognition of the hand finished nature of our products is so heartwarming and important to us. Not only that, but to have you mention our name in the same paragraph as the Moulthrops really hits home. As a lifelong artist and designer, combining my passion for music through these industrial designs has been a dream for many years. I hope the world continues to accept them as you so clearly have. We cannot thank you enough. We hope to come back to this amazing show every year now. I guess it is true what Dave Thomas of Raven Audio told me about it before signing up. LSAF is a family. A close family. It is also a place where little guys like us can plant a seed in the HIFI world and have it watered by writers like you. A show where even the humble beginner can confidently setup their creations and allow the public to witness the conception of the “Next big thing”. LSAF may be a close family, but I have never been as welcomed into a home as I was into this one. For anyone reading this and who never heard of, or never attended LSAF, don’t miss it again!